How to find words as you type, jump to results across all files, and edit at these locations immediately, with a Freeware tool for Windows and Linux/Mac. ASCII 8-bit characters, usually with ISO 8859-1 encoding. To edit a text file, double click on a word in its text. -  whatever you type is inserted into the text. the find and path mask for global search are inactive. -  the INSERT key toggles insert or overwrite mode. -  pressing CONTROL+Z undoes the most recent edit operation. like block replace may count as two or more steps. which brings up a search and replace dialogue. you see two buttons at the right top, "Save" and "Revert". (DView goes back to search mode). are undone, and all open editors are closed. i.e. saving changes then ending the edit session. kept in memory until saved or discarded. but just a SINGLE click to edit text instantly. to allow one click functionality. -  click on the "mode" button at the bottom. -  select "one click edit" (or "o/c edit"). Now, a single click on any word is sufficient to enter edit mode. Of course, this requires more discipline. Look where you click! edited but you start to surf through text. it's best to click into blank space, but not on a word. Stop Edit or Revert button at the top right to undo all changes. changes and stop editing by a double click on blank space. To do so, check Setup / edit / save and stop by double click. -  press CONTROL+F to open the Find And Replace dialog. type the word of interest, press ENTER. -  press ESCAPE to close the find dialogue. -  press F4 or CTRL+A to filter globally for the phrase. "re-edit" button that appears at the right top. want to replace the word "foo" by "bar" multiple times. then ENTER. The first occurrence of "foo" will be searched. -  now you can click on "Find Next", or on "Replace". -  when clicking "Replace", you see the word is replaced. but skips for example thefoo or foo2. foo OR bar     - finds either "foo" or "bar". operators can also be disabled by the "noops" button. It appears at the right bottom if operators are detected. called Repeat Edit, as it allows faster editing in most cases. like a word replacement, and repeat them by pressing CONTROL+R. Example: you want to replace "foo" by "bar" repeatedly. by pressing CONTROL+F, typing "foo", then ENTER. -  close the find dialog by pressing ESCAPE once. the word "foo" is still highlighted. replacing one word by typing over another one. -  now press CONTROL+R (like Repeat). DView will search the next occurrence of "foo". -  you may press CONTROL+R again to have it replaced. and have the next occurrence searched. -  this way you can step through all occurrences of "foo"
want to replace the word, or not. is searched and replaced immediately, in one step. -  go to the first insert position, type the word. -  press CURSOR DOWN to leave the line of edit. -  go to the next insert position. -  press CONTROL+R. the word should be inserted again. -  mark the first word by SHIFT+CURSOR RIGHT. -  press CONTROL+R. the next occurrence will be found. -  press CONTROL+R again to delete the word. -  go to a line's end, type a word. -  go to the next target line, where the word should be appended. the word will be appended after the line's last character. -  change multiple words in the same line. Three views open, editing in the middle view. to insert at the edit cursor in the middle view. To do so, CONTROL+right click on that word. -> it is inserted instantly at the edit position. To do so, SHIFT+CONTROL+right click on that line. -  You see a block of five text lines you want to insert. the first and last line of the text block. Three views open, editing in the left and middle view. to move to the edit cursor in the middle view. 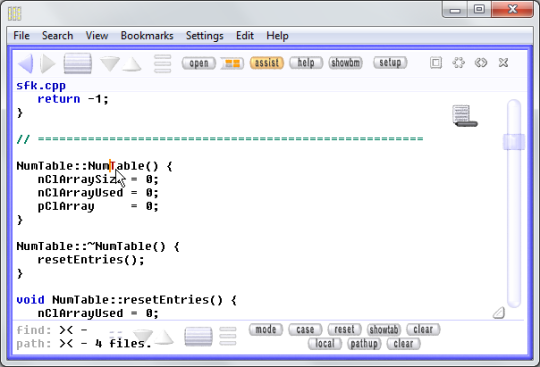 3. press CURSOR DOWN, until all lines are marked. of lines is moved into the second view. Now you want to insert the word "iTheFooCounter"
-  double click on iTheFooCounter. -  CONTROL+C to copy into clipboard. -  click to your editing position. the word is copied into the clipboard. -  press CONTROL+V to insert. at the cursor position immediately. the editor saves it in that mode. otherwise [unix] is displayed. for example with the Swiss File Knife's "remcr" or "addcr" command. is also done with native TAB chars, otherwise as blanks. by activation the mode menu option "always blank tabs". suitable to edit many small text files, but not large ones. Editing of large files (multiple MB of text) can be slow. 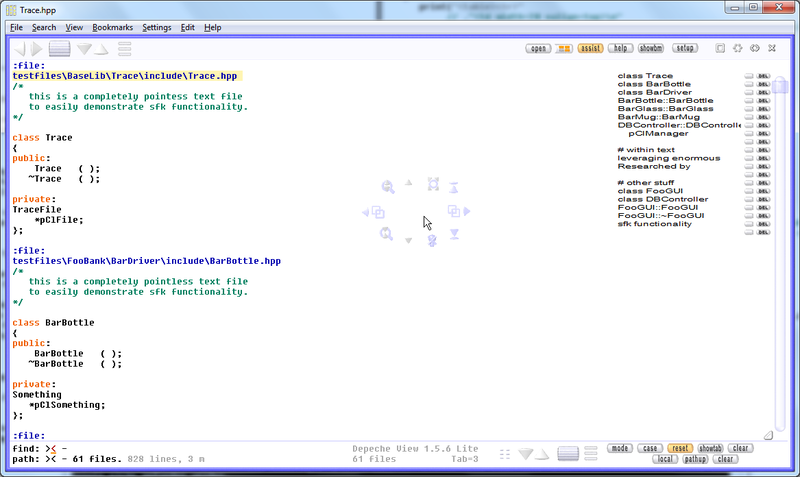 sense to use an external editor, like described here. -  within one window, you can only edit a single text at a time. e.g. by clicking on Save. or clipboard contents cannot be edited as well. -  wrapped text cannot be edited.